All Points Broadband is very pleased to join VACo’s community of public servants and various service providers. Broadband Internet is required for economic development and is now considered an essential residential utility. Community anchor institutions, business parks, government facilities and residential neighborhoods all require high quality broadband. Traditional Internet service providers have deployed fiber or cable in high-density regions but have forced customers onto expensive cellular services across much of Virginia. For most of underserved Virginia, a hybrid-fiber-wireless network is the best option for solving your broadband gap. All Points Broadband is committed to delivering reliable broadband Internet to everyone, regardless of where they live. We build and operate hybrid-fiber-wireless broadband networks supported by quality customer service. Subscribers include everyone from rural homesteads to apartments to commercial buildings. Our service is ideal for community anchor institutions such as schools, libraries and numerous county administrative facilities. All Points Broadband operates Virginia’s premier fixed wireless Internet service provider and is making substantial investments to upgrade and expand this network and expand into new regions. We are partnering with counties to design and build broadband networks in their jurisdictions. Our hybrid-fiber-wireless network will be the optimal solution to provide content-neutral broadband to underserved regions without ongoing subsidies. Resource constrained local governments can reduce costs by consolidating their telecommunications budgets and leveraging their underused vertical assets. We have the expertise and capital to partner with local government and close the ever-expanding digital divide. The successful process involves collaboration between the public and private partners. First, we work with you to determine your telecommunications needs at public facilities and what vertical assets (water towers, building rooftops, tower access rights, etc.) can be used to expand broadband. We use these inputs to design the core of a state-of-the-art hybrid-fiber-wireless network. Once this core is in place, your county can receive better service at reduced cost. We will then invest private capital to continue to expand the network to serve the underserved areas in your county. Depending on resource availability, the time between network planning and providing high quality broadband can be as short as six months. 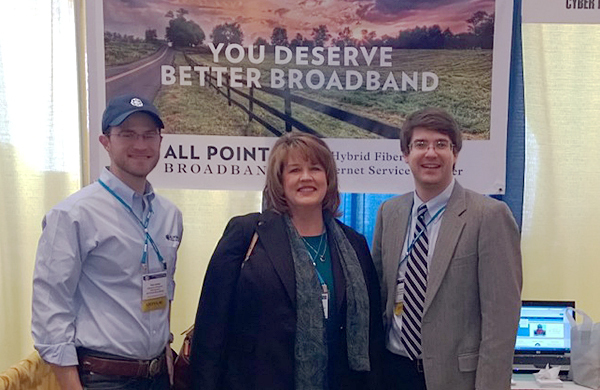 All Points Broadband is available to meet with your county or region to discuss your broadband needs and options.